Conor Sheary's second goal of the game with 48.2 seconds left in overtime Friday gave the Buffalo Sabres a 4-3 win over the visiting Pittsburgh Penguins. Sheary's shot from above the left hash mark sailed past the blocker of goaltender Matt Murray on the winner. Newly acquired defenseman Brandon Montour tied it 3-3 for Buffalo with 2:32 left in regulation on a long-range shot that wove its way through a crowded crease, and he also had an assist. Jack Eichel also scored for Buffalo, which ended a two-game losing streak. Linus Ullmark, facing Pittsburgh for the first time in his career, made 41 saves as the Penguins outshot the Sabres 44-30. Sidney Crosby had a goal and an assist, Nick Bjugstad and Patric Hornqvist also scored, and Justin Schultz had two assists for Pittsburgh, which has lost three of four (1-1-2). Murray made 26 saves in the losing effort. Eichel extended his point streak to seven games when he gave Buffalo a 1-0 lead at 3:09 of the first. Penguins defenseman Marcus Pettersson turned the puck over on an attempted outlet pass. Sam Reinhart got to the puck and touch-passed it to Eichel, who scored from the left circle. Bjugstad tied it 56 seconds later. His shot from the left circle squeaked in on the short side. On a Sabres power play, Sheary took a set-up in the low slot from Kyle Okposo and lifted the puck past Murray for a 2-1 Sabres lead at 12:53 of the first. 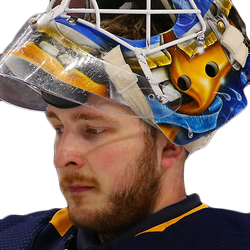 With 3:35 left in the second, Buffalo's Scott Wilson took a double-minor penalty for high-sticking Pettersson, and Pittsburgh cashed in on both penalties to take the lead. Hornqvist, playing in his 700th game, tied it at 17:18 when he tipped a Schultz shot past Ullmark. Crosby gave the Penguins a 3-2 lead at 18:21. 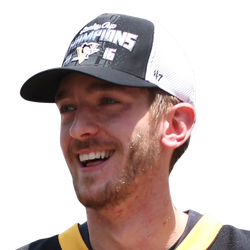 From the right dot and, while falling, he took a pass from Evgeni Malkin and snapped the puck past Ullmark as the goalie slid to his left. It was Crosby's 28th goal of the season and 439th of his career, tying him with Jaromir Jagr for second-most in Penguins history behind Mario Lemieux's 690.